Alison Gilmore grew up amid the rolling green hills and narrow roads west of Belfast, Northern Ireland, and she’s well aware of how the “troubles” reached their formal end. She knows the Good Friday Agreement was signed in April 1998—after more than 3,600 people had died, and thousands more were injured. She remembers how both sides, for the most part, laid down their arms and agreed to share power. 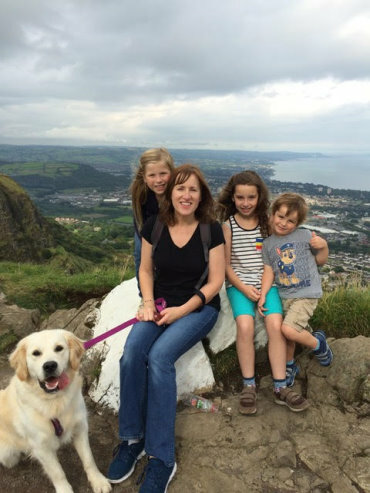 Alison Gilmore is shown here with her three children and family pet on the hillsides of Northern Ireland. It’s a place she remembers well, having grown up in the countryside west of Belfast in the village of Tempo. How peace, or a semblance of it, was restored after three decades of bloodshed. Sometimes, in her counseling office at East Belfast Mission—a nonprofit with a 170-year-old history of serving the poor and marginalized within the city—Gilmore has her doubts. In that room, with its soothing, apple green walls and burning candles, the violence, hate and anger still rage. Sometimes she has to schedule personal recovery time between therapy sessions. The mission—which includes a homeless shelter, a worshipping congregation of about 200 people, education classes and job training—offers free counseling to all in the community. Gilmore estimates 75 percent of the issues she treats are directly related to the fighting. Her clients are victims and aggressors and everything in between, paralyzed by guilt and shame, unsure of how to make peace with the past. Walking through those painful memories alongside her clients is more than a job for Gilmore, who hails from the sleepy village of Tempo in County Fermanagh. It’s an opportunity to use her God-given talents to help heal her home country after so many years of conflict. Before returning in 2011, she and Britt had lived in America for eight years, and she knew the transition would be challenging. “Ireland was home, but I was also away long enough to realize that home changes and to fit back in would never be easy,” she said. Gilmore admits to being surprised by the extent of emotional trauma in Belfast. She saw families plagued by hostility and depression and an alarming increase in suicide across the country. Those still-raw wounds were evident in January 2013 when protests, some of which were violent, erupted near the mission after Belfast officials voted to limit the number of days City Hall would fly the British flag. One year later, angry loyalists protested outside the mission when it hosted a reconciliation program that featured Brighton bomber Patrick Magee and Jo Berry, the daughter of one of his victims. 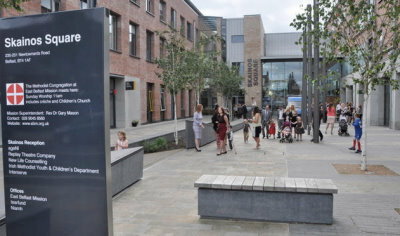 Home to East Belfast Mission, the Skainos Centre is part of an urban regeneration project in the inner city. It’s described as a space for community transformation and renewal. The civic square hosts outdoor concerts, farmers markets and other events. The soft-spoken mother of three—12-year-old Ellie, 10-year-old Emily and 6-year-old Jake—considers herself fortunate to have lived “a very peaceful and carefree childhood” in Tempo with an extended family that included 48 first cousins. Divisions and strife between Catholics and Protestants were simply a normal part of daily village life. When Gilmore was about 12, she experienced her first bombing in the nearby town of Enniskillen while shopping for back-to-school uniforms. A few years later, in 1987, Enniskillen drew worldwide attention when a massive Irish Republican Army (IRA) bomb killed 12 people at a Remembrance Day service. Gilmore’s father lost a cousin and his wife in the blast. Although her parents were open-minded and never taught her to dislike Catholics, she readily admits to a fear of Republican neighborhoods that lingers to this day. Gilmore works hard to keep that in mind when she’s helping clients sort through deep-seated hatred of “the other side.” But the darkness can be overwhelming. In those moments, Gilmore holds tightly to the power of God’s grace, balancing two different images, so many clients share with her—the person they once were and the person they want to be. “As we deal with the wounds of pain and despair, I also gently share the new picture of light and goodness and a better way,” she said. “We walk there together. For many, and this is key, it is not going to be a 10-step change. It will never be Eden for any of us, but if it can be only two steps better, then I’m thrilled. Gilmore also chooses to focus on the long game. –Kari C. Barlow is a freelance journalist based in Pensacola. Read more of our conversation with Alison Gilmore, a UMC Missionary serving in Northern Ireland. What are you teaching your children about Catholics or anyone who is different from them? What do you stress to them? We don’t mention terms like Catholic or Protestant. We are working through how as a family and a believing-in-God family makes us different. There are few Christians in their classes, and pressure for material possessions is huge. This is a whole new conversation, but we want to show that our root is in Jesus: His love and gentleness and acceptance of who you are. As a wife, mother and counselor with many other roles, how do you keep your eyes on God and stay focused on his will? I recently created a table of things important to me: pictures of the kids, Britt, my mum, dried flowers, bible, bullet journal, pens, a candle and cross. I try and sit here each day to be still and live these words I have challenged myself with: whole, grounded, gracious. I like to read, listen to music, and I’m beginning to enjoy some Celtic prayers and liturgy—not common from my Protestant background! Do you have a favorite scripture that brings you comfort or gives guidance? Or a hymn or music that you turn to regularly? For the Lord, your God is living among you. What is your hope for East Belfast Mission in the future? I think that verse encapsulates what I hope for: not to live in fear; to know that the presence of God is close by and how incredibly beautiful to know that He, the sovereign one, who gathers nations, rejoices over us. That is the Garden of Eden for me, as we live in barren lands.